^ 2010 Census Redistricting Data (Public Law 94-171) Summary File - Place. American FactFinder. United States Census Bureau. [25 August 2012]. ^ 2.0 2.1 American FactFinder. United States Census Bureau. [2008-01-31]. ^ Profile for Richland, Washington. ePodunk. [2010-05-28]. 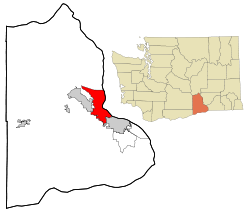 ^ Subcounty population estimates: Washington 2000-2007. United States Census Bureau, Population Division. 2009-03-18 [2009-05-10]. （原始内容 (CSV)存档于2009-03-31）.